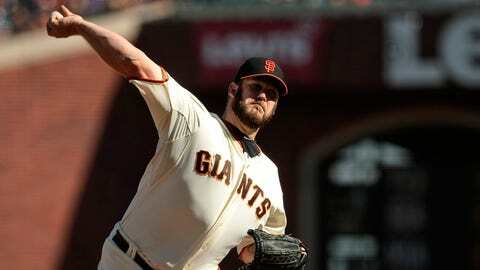 Brad Penny took last season off to rest after pitching for the Giants in 2012. KANSAS CITY, Mo. — The Royals have signed right-hander Brad Penny to a minor league contract, Royals general manager Dayton Moore confirmed Thursday. An agreement between Penny and the Royals was first reported by Chris Cotillo of MLBDailyDish.com. Moore, who is in Arizona for organizational meetings, said by phone that Penny will get a spring training invite and compete with several other candidates for the fourth or fifth spot in the rotation. The signing of Penny, who worked out in Kansas City this off-season, isn’t just a courtesy, Moore said. "We wouldn’t do that because of the limited amount of openings for invites that we have," Moore said. "Our scouts have told me that he threw free and easy during workouts. We’ll see what he has. "He has been a quality pitcher during his big league career. I know he wants to pitch for us." At age 35, Penny, though, likely will be a long shot competing with Danny Duffy, Luke Hochevar, Yordano Ventura, Wade Davis, Kyle Zimmer and Chris Dwyer, among others, for one of two spots in the rotation. James Shields, Jason Vargas and Jeremy Guthrie are set at the top of the rotation. "We’ll see," Moore said. "He’s a veteran with a lot of experience who has taken some time off. We’ll see how his arm is come spring." Penny took all of 2013 off to rest what he called a tired arm. He last pitched in 2012 for the San Francisco Giants and in 22 relief appearances had a 6.11 ERA and a Jonathan Sanchez-ish 1.82 WHIP. Penny’s best season came with the Dodgers in 2007, when he logged 208 innings and was 16-4 with a 3.03 ERA and a 1.31 WHIP. Also on Thursday, the Royals announced the signing of veteran reliever Guillermo Mota to a minor league deal. Like Penny, Mota, 40, last pitched in the majors for the Giants in 2012. He had a 5.23 ERA in 26 relief appearances over 20 2/3 innings. He has a 39-45 record with a 3.94 ERA in 743 career appearances — all in relief. The right-hander also has been invited to spring training with the Royals.